The airstrikes are the first by the US government in Libya since January. The self-declared caliphate lost its safe haven in Sirte, a city on the Mediterranean coast, late last year. At the height of its power, the group considered Sirte to be one of the three most important cities under its control, ranking behind only Mosul, Iraq and Raqqa, Syria in terms of prominence. A US-backed coalition pushed the jihadists out Mosul earlier this year and they have lost substantial ground inside Raqqa as well. Between Aug. 1 and Dec. 19, 2016, AFRICOM conducted “495 precision airstrikes” as part of Operation Odyssey Lightning. The operation, carried out in conjunction with the Libyan Government of National Accord (GNA), successfully dislodged the Islamic State from Sirte after seven months of heavy fighting. But the victory was costly for the GNA-backed militiamen responsible for the ground assault. More than 700 GNA-sponsored fighters were reportedly killed and thousands more wounded. In Jan. 2017, the US bombed two Islamic State training camps south of Sirte, citing the presence of the group’s “external plotters.” The Defense Department estimated that dozens of jihadists were killed. Subsequent reporting revealed that the “external plotters” were connected to attacks in Europe, including the Dec. 19 Berlin Christmas market attack and possibly the May 22 Manchester Arena bombing. Since losing Sirte, the Islamic State has been trying to regroup inside Libya. In August, Abu Bakr al Baghdadi’s loyalists raided a checkpoint in the Jufra region, which is south of Sirte in the middle of Libya. Amaq News Agency, a propaganda arm of the so-called caliphate, claimed that 21 members of General Khalifa Haftar’s “militia” were “killed and wounded” during the attack. Haftar leads the Libyan National Army (LNA), which has fought the Islamic State’s men in several areas. Then, earlier today, Wilayah Barqah (an Islamic State “province” in Libya) released a 17-minute video advertising the group’s continued presence inside the country. The footage contains scenes of the aforementioned checkpoints, as well as other operations. Some of the footage documents the jihadists’ monkish life in Libya’s deserts. According to the State Department’s Country Reports on Terrorism 2016, the so-called caliphate lost a significant number of its fighters during the battle for Sirte. Yet, several thousand of its men were either stationed elsewhere or survived the siege. State also cited reports saying that Baghdadi’s organization had “as many as 6,000 fighters in its ranks” as of early 2016 — that is, several months before the US began its air campaign in Sirte in Aug. 2016. The number of jihadists fighting under its banner swelled between 2015 and 2016, as the Islamic State “doubled its presence in the country” during that time. Taken at face value, therefore, the State Department’s report suggested that approximately 4,300 members of the Islamic State’s Libyan arm were not killed during the operation to free Sirte from the jihadists’ grip. It is not clear how many of these men are stationed in Libya, or fled elsewhere. Nor is it known how many were killed in other operations inside Libya since then. Foggy Bottom also warned that the Islamic State has cadres sprinkled throughout the country. Muhajir was asked about the Islamic State’s strength in “regions outside of Sirte.” He claimed that the number of “mujahid brothers in the Libyan wilayat [province] continue to be…abundant.” Their “covert units are scattered throughout all the cities and regions, and their detachments cruise the deserts both east and west.” Although he exaggerated his followers’ capabilities, there was some truth in Muhajir’s claims. 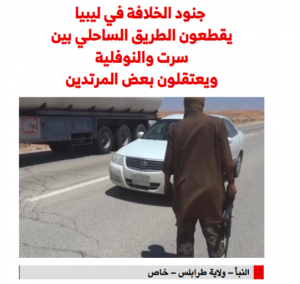 While the Islamic State has consistently advertised its presence in Libya, however, al Qaeda and its regional branch, al Qaeda in the Islamic Maghreb (AQIM), have often sought to obscure the extent of their network in North Africa. For instance, the State Department noted in July that AQIM has backed alliances fighting in Benghazi. “In the second half of 2016,” State reported, “AQIM increased its personnel and weapons support to the Benghazi Revolutionary Shura Council [BRSC] and the Benghazi Defense Brigades [BDB].” The BDB has denied links to known terrorist organizations, a claim that the US government clearly doesn’t buy.